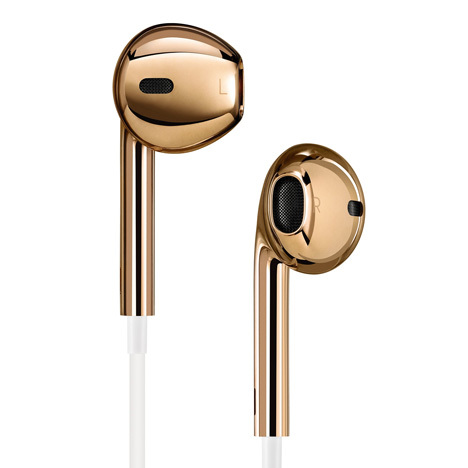 News: designers Jonathan Ive and Marc Newson have collaborated with U2 frontman Bono to design and curate items for his (RED) charity auction, including a pair of solid rose gold Apple EarPods (pictured). Apple senior vice president of design Jonathan Ive and Australian designer Marc Newson designed and selected a series of one-off or customised pieces for the (RED) Auction. The event at Sotheby’s New York on 23 November 2013 has been organised by Bono to raise money to tackle AIDS, tuberculosis and malaria. Ive and Newson worked together to create unique products including a Leica Digital Rangefinder Camera and an aluminium desk. The pair has customised a Steinway & Sons Parlour Grand Piano and a 2012 Range Rover as well. Also up for auction are two Damien Hirst Spin Chairs designed by Jasper Morrison, plus Dom Pérignon champagne and accessories. Highlights of items in the auction will travel to London and Hong Kong before being going on public display in New York from 18 September. Earlier this year Ive unveiled Apple's iOS 7 user interface redesign. We've previously featured a laser suit worn by Bono on U2's 2010 world tour. Two of the world's foremost design pioneers, Sir Jonathan Ive, KBE and Marc Newson, CBE, have collaborated with musician and philanthropist Bono to organise a (RED) auction celebrating the very best of design and innovation to be held at Sotheby’s New York on 23 November 2013. Jony and Marc have spent the past year and a half curating the collection, which comprises objects from disciplines as diverse as space travel and lighting design to contemporary art and rare automobiles, all unified and distinguished by their excellence and innovation. Proceeds from the sale will benefit The Global Fund to fight AIDS, Tuberculosis and Malaria. Leading the auction are two items designed in their entirety by Jony and Marc – a unique Leica Digital Rangefinder Camera, a feat of extraordinary engineering, and a unique aluminium desk produced by Neal Feay Studios. Joining these editions labelled 01/01 and personally curated by the two for the (RED) auction are: a Steinway & Sons Parlor Grand Piano and a 2012 Range Rover, both customised by Jony and Marc; a unique version of Hermès' iconic Cavale saddle created in red leather and custom red stitching; a one-of-a-kind pair of classic Apple EarPods in solid rose gold; a Russian cosmonaut suit; a pair of Damien Hirst Spin Chairs designed by Jasper Morrison; a custom Jaeger-LeCoultre Atmos 561 Clock with unique red accents created for the auction; and Dom Pérignon Œnothèque 1966 Magnum with custom red foil label, red ice bucket cooler and limited edition protective case. Highlights from the sale will travel to London and Hong Kong in advance of the sale before the entire collection goes on public exhibition in New York beginning 18 November. Learn more about the second (RED) Auction through our Twitter hashtag #REDatSothebys. Additional highlights and details to be revealed over the next several months.